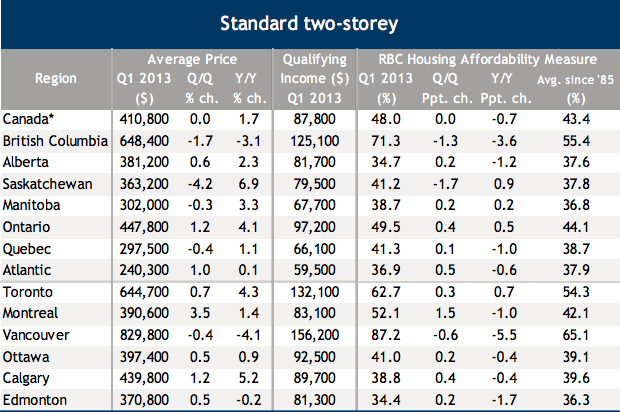 RBC Economics Research released their latest Housing Trends and Affordability Report for the first quarter of 2013 and the tightening of mortgage rules appear to have had a slight moderating effect on some of Canada’s hottest, priciest markets. Their Affordability Measure is based on the costs of owning a detached bungalow at market value (a reasonable property benchmark in Canada), though RBC still measures the price of other property types such as two-storey houses and condos. In a nutshell, the higher the reading, the more expensive the market. If a region clocks a reading of 50 per cent, that means homeownership costs take up 50 per cent of a typical household’s monthly pre-tax income. RBC described the province as moving from “hot-ish” to more “temparte-ish” market conditions with prices rising 1.2 per cent from the previous quarter to $447,800. Year-over-year, it saw a 4.1 per cent boost in values and the province scored a 49.5 reading for affordability. The West Coast became a touch less unaffordable, though it’s still the most expensive province to buy into. 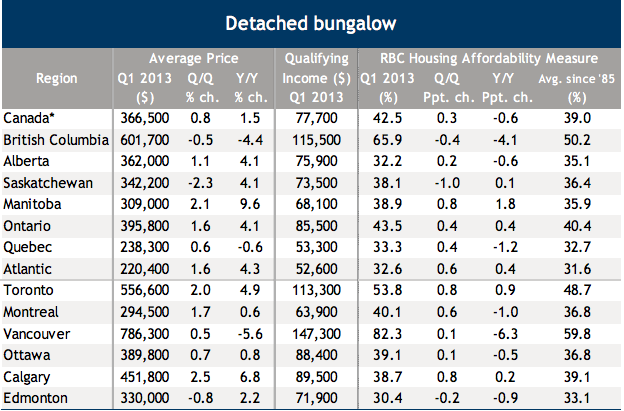 BC was the only province to see prices decline year-over-year in all three housing types. The average price fell by 0.5 per cent from last quarter and dropped 4.4 per cent to $601,700. 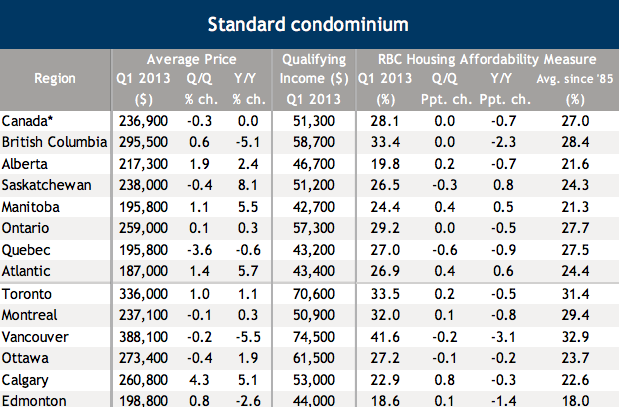 Still, the province’s affordability measure was the highest in the country at 65.9. RBC characterized the homebuyers as “hesitant.” Despite the relative affordability, residents didn’t seem too eager to jump into the market (Quebec posted the second-weakest first-quarter results for home resales in 10 years in the province). Prices barely budged, dropping by 0.6 per cent year-over-year and rising 0.6 per cent from the last quarter of 2012 for a new average of $238,300. The affordability measure was 33.3. The province saw a 4.1 per cent boost in prices year-over-year and an increase of 1.1 per cent since the previous quarter. With prices averaging at $362,000, the province’s affordability measure came in at 32.2. Vancouver kept its priciest city tile, earning an affordability measure reading of 82.3. Still, that number did drop by 6.3 per cent since the first quarter of 2012. Toronto came in next, with an affordability measure of 53.8, up 0.8 per cent since the last quarter and 0.9 per cent year-over-year. 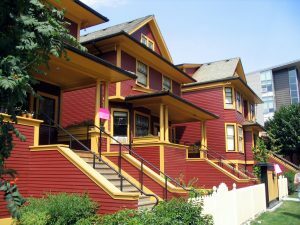 Montreal posted an affordability measure of 40. 1 per cent, up 0.6 per cent from the fourth quarter of 2012 and down 1 per cent from the same period of 2012. Ottawa came in close behind with an affordability measure of 39.1, barely moving since 2012 : the measure was up 0.1 per cent from the previous quarter and down 0.5 per cent year-over-year. Calgary measured 38.7 in the first quarter of 2013, up 0.8 per cent from the previous quarter and up 0.2 per cent since the same time in 2012.